Adapted from Better Homes & Garden’s New Cook Book, Limited Edition(Pink), 12th Edition. 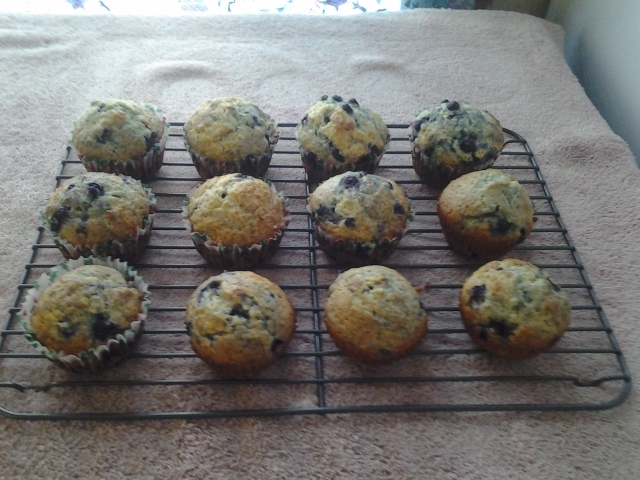 I increased the sugar, baking powder and blueberries. In a large bowl mix dry ingredients together, flour, sugar, baking powder, salt and lemon peel. Use a wire whisk to mix the dry ingredients together. Using a 1 cup (250 ml) measuring cup, add milk, then oil and last the egg. Use a fork to mix the wet ingredients. Something, I learned from watching Rachel Allen’s cooking show. Add the wet ingredients to the dry ingredients, mixing with a spoon till all the ingredients are incorporated. Add the blueberries last, if the berries were frozen, keep them frozen till the your ready to add them to the mix. Bake in preheated 400F (205C) oven for 18 minutes. Makes 12 muffins, I use muffin papers to make cleanup a breeze.